Most of us will agree that among the contemporary comic strip artists, Matthias Lehmann is one of the greatest masters of the scratchboard. The most enthusiastic admirers claim he draws the most beautiful women since Georges Pichard. A less know fact is that his fingers, somewhat stiff from the mentioned technique, do magic with several string instruments, preferably in the rhythms of old-time country, blues or bluegrass, for which he is quite the expert. It is unnecessary to point out that Matthias, this issue’s Profile, is one of the honorary authors. He was interviewed by J.K. In your comics, as well as in some of your works of art (paintings, scratchboards), you’re quite open about the Brazilian side of your cultural heritage: mythological creatures like theboitatá roam the highlands of Minas Gerais in the Brazilian interior. Was this tradition a part of your upbringing or did you develop interest in it later? It’s always been there. My mother is Brazilian, my father French. My sisters and I were all born in France. My mother, who has never been particularly happy living in this country, found it very important to transfer her culture to us. So it is a part of us and I was always fond of its folkloric aspect. But in my twenties, I started to feel the urge to learn more about this culture, because I had never felt a real connection with my origins. I had to get closer to it. I studied folklore and came across mysterious characters like the boitatá and sassi pereré – the latter is my true obsession (and probably also for a lot of Brazilians and Portuguese as well as other artists). I would read Monteiro Lobato’s tales and look for Guignard’s great renderings of Minas Gerais. Artistically speaking, the abundance of mythology is very inspiring; this popular culture has a peculiar bizarre twist, which would, in my opinion, have great difficulty permeating French culture. However, I think most people of mixed origin feel similar. You never feel like the kids in the country where you were born and raised – there are so many obstacles like the language or even food that make you different. On the other hand, you can never be like the kids in your parent’s country simply because you don’t live there. You have to grow your own roots; it takes time and causes a lot of difficulties. I guess this is why HWY115 is set in such an undefined place; in my latest books things definitely take place in France. My mixed origin is a blessing and a curse at the same time. Apart from the Brazilian counterparts to this music, musica caipira and sertaneja, you are known to be a big fan (heck, a connoisseur would be a better term!) of old-time country, bluegrass, and blues. You also play several string instruments. There are quite a number of cartoonists like Crumb and Ware involved in this music more or less seriously. How do you explain this phenomenon? Nervous fingers or something deeper? I wish I were a connoisseur! I can’t speak for anybody else, but I think there are several possible explanations: first, a certain rejection of contemporariness. Second, it’s easier for a cartoonist, who is quite used to loneliness, to identify with musicians that sing about it most of the time, and who are said to be more or less the same (which in fact isn’t true, because women love musicians). Third, through music, they secretly hope that playing will transform them from lonely cartoonists into seductive musicians. Fourth, this music is great and the cartoonists you mentioned have great taste. Fifth, these genres and especially ragtime (like in the case of Chris Ware who really is a ragtime expert) have a rhythmic feature in common with comics: syncopation. But I’m glad that you pointed out the “nervous fingers” phenomenon, because I feel them often. You know other cartoonists tend to turn into compulsive masturbators; you just have to do something with your hands! 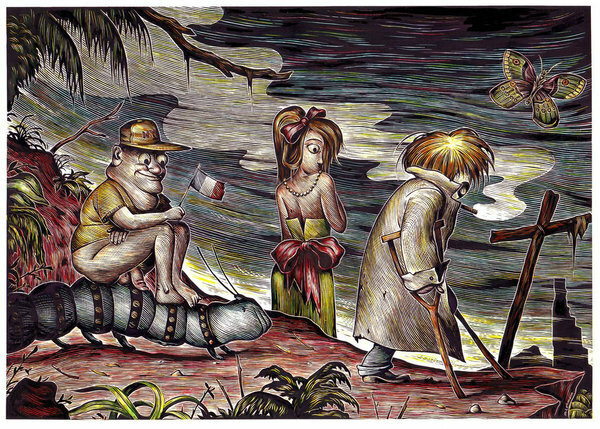 Despite the fact you’re still very young, you’re one of the most accomplished cartoonists working with scratchboard. How did you discover it? Just by trying out different techniques. First, I experimented with linocut and woodcut and then I switched to scratchboard. Somehow, it was love at first sight – I also enjoyed its noisy aspect:scratch scratch scratch. It was also great because I felt like I could imitate Charles Burns’ famous shadow lines. What was I thinking?? I was such a huge Burns fan. Then I discovered Thomas Ott and Marc Caro. In fact, the first comic book done in scratchboard I ever saw was Caro’s In Vitro. I borrowed it from the library when I was about eleven, and back then, it was the strangest thing I had ever seen. Artists like Scott Gillis, Brad Teare, and Pascal Doury, who has had such a strong influence on me, led me to believe I could create an entire book using this technique. They ruined my life. Your scratchboard technique development goes against the usual, logical direction; you started with a more stylized approach and moved in the direction of naturalism. What’s the reason for this? I think this is because at some point, I was really into very realistic etching or lithograph illustrations dating back to the end of the 19th century. They were a common alternative to photography, which was hard to reproduce back then, and I tried really hard to imitate them. You can depict a feeling of weirdness much better through a naturalistic drawing than through a stylized one that warns you in advance: “This is going to be weird”. The similar thing happens in Hergé’s books; the drawing is very traditional, but Tintin stories are really bizarre, they are stranger than Charles Burns! “Gumbo,” like many of your works, has a strong theatrical character: the scenography is limited to the interior; the emphasis is put on the dialogues, facial expressions, and body language. Do you go to the theater often? I’m afraid not. I have been to the theater twice this year only because people I know were performing. But it is true that I’m interested in the construction of a play. The manner of writing is the same as my scenarios: stage directions and dialogues. The rest is a matter of “directing.” I wanted to put some theatricality into “Gumbo” because, in a way, it creates a distance from the plot, which is very ordinary: a dinner between friends, nothing original. I guess the theatricality is also inherent to the behind-closed-doors aspect of the story. Your comic work is either painted or done on scratchboard. Off the top of my head, I can’t think of any comics that you have done with the regular pen/brush and ink method. Why’s that? No, I’ve done around 60 pages of short stories in ink with either brushes or Rotring pens. The very first story published in Stripburger, for instance, was not a scratchboard. It was a long time ago, maybe in 1994 or 1995. But that was terrible. Scratchboard was a revelation, probably because I didn’t trust my line enough (I still don’t) which is maybe the most important aspect of drawing. Scratchboard is also a different approach and involves more working with the “material” (I mean substance), like painting. Painting is an atavism in my family, but it took me years before I found the courage to paint on a canvas and I only started oil painting last year. That was something, now I really don’t want to use acrylics any more. ANYWAY, this is changing, because now my goal is to go back to the essence of drawing – at least concerning my comic books, not necessarily the non-narrative images or illustrations. This will enable me to use pens in the book I’m working on right now. The title of the book in French is Les Larmes d’Ezechiel and it has some scratchboard, but is mostly done with pens. The next step is to make an entire graphic novel without doing any sketches. I’ve started something, I don’t know yet what it will be, probably only junk. I’m sort of running away from elaboration, because with HWY115, I came to the point where I would have 20 filters between what I had written in the scenario and what I drew on the page. The consequence then is that creating comics is simply BORING.